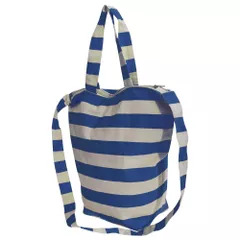 Ladies summer beach bag with striped design. Top carry handles and shoulder strap for easy transportation. Main compartment with inner open top pocket and secured with zip fastener. Size (excluding handles): Width- 38cm (15in), Length- 38cm (15in), Depth- 14cm (5.6in). Material: outer- 95% Cotton and 5% Polyester, lining- 100% Polyester.